Phase 4 make dramas. We have ventured into the realms of documentary, but this is not our main area of interest. I don't think it's possible to say what is a "typical" Phase 4 production. Many themes re-occur and there are similarities in construction and plots, but I think each is unique. Lets start at a logical point, the idea! To be more precise though, I refer to it as the spark that leads to the idea. Where do these come from? Often from some real life incident which has happened to me, to someone I know, or as reported in a book or newspaper. The spark usually hits me during the night, when I lie awake creating a story in my head. Sometimes I have the whole story at one go, but more often it's 70%-80% finished before a word is actually typed. Ideally I would like the finished movie to entertain, amuse, excite. I want it to interest, mystify, intrigue or to make you think. The first Someone came about because the annual NERIAC competition includes a set theme. NERIAC chairman, Linda Gough, chose for 2000: "The Time of Your Life." Immediately this suggested to me that the line: "This should be the time of your life", ought to be spoken at the start of the film to one of the main characters to set up the plot. It also struck me that the main character would be in his or her "middle" years and perhaps feel that time is passing them by. Typically, entries for this competition are comedies, so it was clear from the start that ours should be too. Ideas formed and I decided that our "hero" should be a man and the person giving him advice about his future should be his sister. The story would be about a search for love! During the script writing I ask myself questions, such as: "How did the characters get to this point?" and "Where do they go next?" This builds and develops the plot, which usually grows from an idea that comes in the middle of the movie. The story continues towards the end and then I fill in the beginning. For me, casting is an integral part of writing. Perhaps this is because in earlier days Phase 4 consisted of half a dozen possible actors and, writing was done with them in mind. There was little point in coming up with characters which were way beyond our actual ages. During the 1990s, we were all in our 30s to 40s, so parts above and below this age group proved a problem. We had come to realise that there was a limited number of permutations with so few actors in the group and it was becoming unbelievable when we gave a show and our audiences repeatedly saw the same faces over and over again. To get round this, in 1997 I contacted our local amateur theatre group, to ask if anyone was interested in taking part in our films. However, my method of writing, with the person who would eventually play the part fixed in my mind's eye, became second nature. I could see their face, hear their voice and imagine how they would act the part on screen. So it is, that even with a bigger pool of actors to choose from, I still cast the main parts in my head before I write. Keith Pottage was in my mind from the start to play "our hero." As regular theatre-goers, we had seen him in a number of plays over the years, usually in a leading role with the Wakefield Theatre Group. I had always found him amusing and interesting to watch on stage and often toyed with the idea of contacting him to see if he would be interested in acting with us. The script was written with him in mind and for ease of reference, I called the character "Keith" too. I didn't know at this stage if he would do it. Narelle Summers Narelle Summers, one of our actors, knew Keith and offered to contact him and show him the script. A few days later, I received a phone call to say, "Yes, he would like to do it." My wife, Carol, seemed an obvious choice to play Keith's "sensible" sister, Muriel . Phase 4 regular, Yvonne Crann would play his ultimate blind date. Narelle and Miranda Foxton, another of our theatre actors, would play his other potential dates. Phillip Crann, our other stalwart actor, would help behind the scenes on this one. The script was six pages long ... about 10 to 12 minutes of screen time (the competition had a 10 minute limit.) We anticipated two or three shooting sessions. We started with the first scene in the film. Carol and Keith playing brother and sister, Muriel and Keith, are sat on a bench in the cemetery discussing the future; i.e. laying out the plot for the audience. (In a 10 minute film, we have no time for subtle character and story development!) Carol had a long, complicated speech as she set the scene for what was to follow, including the "theme" and the title, "Someone For Everyone", in her dialogue. The weather was changing (for the worse) and this was the first time we had met Keith. In hindsight, it would have been a good idea to have had a get-together/ rehearsal to see how everyone would gel and to explain our methods to Keith, but I knew he had acted in other amateur films and thought this unnecessary. Unfortunately, Carol couldn't remember her lines. This is always a bad sign as when this happens things tend to go from bad to worse. Such was the case here and despite prompting and several takes, we couldn't get the shot. We pressed on, doing close-ups and medium close-ups of both Carol and Keith as the dialogue was shot in fragments. The wind was getting up (skipping the jokes) and the sky was overcast. Keith's dialogue referred to it being a nice day, so I tried to lighten the image on camera. We were shooting the third scene in the finished film due to actor availability. At the bus stop, Keith is clumsily trying to make a date with Miranda, who is playing the girl waiting for a bus. After the first week's problem, Carol and I had rehearsed "the kitchen scene" repeatedly until it was second nature. Unfortunately, over-rehearsing can affect the performances until they sound wooden and mechanical, but we decided it was worth the risk. We shot this scene first to "get it out of the way." The scene caused problems as we needed lights, never my favourite method, and we had two people holding lighting units plus the tripod with microphone in a fairly small kitchen. It was rather cramped to say the least. It was the fourth scene in the film. Then it was back to the cemetery for the movie's second scene, Keith's first attempt at picking up a girl. This master shot is over a minute long, but as Keith and Narelle got into their strides, I didn't want to spoil the flow by cutting into the scene. This turned out to be one of the funniest in the finished film. Next it was down to the park for the meeting between Keith and Clarissa (Yvonne.) I had found several possible locations, but one problem with filming in public places is interference from non film makers. People actually were sitting in the park and this dictated where we could shoot. I chose a spot under a floral arch which was picturesque but had lighting problems with a bright background. Also the sun bobbed in and out from behind the clouds (good title!) playing havoc with continuity. We had really got on with the shoot this time and were on the last page. It was around 4.30pm and when Keith said he hadn't learned this bit yet, I asked if we should stop and return the next week. The consensus was that we were within sight of the finishing post and should continue. So we pressed on, the actors learning a couple of sentences at a time. There were inevitably a few fluffs but the last shots were completed. On viewing the rushes at home, I noticed that the end scene had few close-ups due to the hastily shot sequence. We had several of Keith, but few of Clarissa. I asked for a mini-shoot with Yvonne the following Saturday, to add close-ups, and this we agreed to do. This shoot was a formality to fill in the missing bits. At a stroke, I will skip the many months of battling with the computer, editing cards, motherboards, graphics cards and software, so well documented in my Film & Video Maker magazine articles and go straight to "the cut." The opening scene in the cemetery was a nightmare to edit. As you will recall, we never actually got the scene as it was written. It was, therefore, constructed as closely as possible from available material using bits from different takes and using the sound from one shot over pictures from another. This eventually came together and you would hardly guess in the finished movie the trouble this scene had caused. It wasn't perfect, but it was as good as it could be from the raw material. Keith's first "encounter" with Narelle had some continuity problems as we had started filming with them both wearing sunglasses and then decided to remove them, necessitating shots showing the glasses being removed. Wind noise also had to be reduced where possible and smoothed between shots. Apart from a few problems with sunny / not sunny shots at the end and Yvonne's eye-lines and head positions not always matching up, the rest of the edit went fairly well. The final running time was 11 minutes, one minute over the maximum allowed, so it was back to the computer for some tweaking and minor deletes which to some degree spoiled the flow. As a postscript, as is common practice with me, I returned twice more to Someone for Everyone to re-edit to make improvements and (after the 10 minute limitation was no longer needed) to re-insert the missing shots, until it was as good as I could make it. I have often been asked about my music as people have commented how well it all fits. This is another area where I spend lots of time searching for the right track as I usually have a clear idea of what I am looking for. Someone For Everyone didn't fit into this category and all I knew was that it should be something "quirky." It can sometimes be a long search amongst my own music collection or at the public libraries in Leeds or Wakefield to find the right piece, but this was found fairly quickly at home from an old cassette (not the best source) of oddities called "Tuba... something." It seemed to fit the mood well and was used in three places in the film. Someone For Everyone was initially completed in October 2000 and although it was well received and got quite a few laughs at screenings, it was pipped at the post for the NERIAC competition. It was, as mentioned above, subsequently re-edited prior to its entry into "Movie 2002" where it received a Silver seal and went down very well at its showing there. These are not usual for Phase 4, but we all felt that the first film had only just started when it had to end. The characters of Keith and Clarissa had met late on in Someone For Everyone and we wanted to know what happened next. At our shows, a number of people asked if there would be another one. I had been giving this some thought and early in 2001 I had decided that their relationship should lead to their marriage. The new script would be called Someone For Life and during April and May I was writing and planning this film along with several other projects. (Lately, it's not uncommon to have four or five different ideas on the go at once.) Except for the ending, Someone For Life was almost at completed shooting script stage when our holiday in Corfu came up, so I used our sun-bathing time to ponder the finale. So it was on our one and only day of heavy rainstorms, that I sat in the apartment, writing the wedding scene for the end of the film. Someone For Life is a more polished and ambitious production and with a bigger cast. 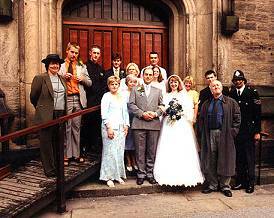 The church scene had 15 actors, most in suitable wedding day clothes plus two policeman and a detective and needed a lot of planning to co-ordinate everything that was going on. It has some funny scenes, but more drama and character development. Perhaps it's not as good a comedy and obviously loses some of the surprise of the first film, but it's certainly smoother and probably a better acted movie. It was given a Gold seal at "Movie 2002" and won best film and best comedy at the Burnley Film Festival. This led to thoughts of whether we should leave it there, but I pushed the idea of one more episode. As far as I could see, the first two films completed the story in a satisfactory way but the characters were rich with possibility and could be transposed into a completely new setting and situation. This film is set one year later so the characters would have to change a little as they would do in real life and the concept is quite different. I wanted to retain the bones of what the previous films had, but to change several of the running gags and go in a new direction. The new structure also imposes restrictions on me in that most of the actors from the other films can't be used as their inclusion would look too contrived. The script is written and approved and should be shooting this summer (2002.) The title will be Someone Special. It should be lots of fun to make.